Students in the School of Social Work in Falk College recently explored one of the most complex and difficult issues in America today: the unsettling interactions between gun violence, community relations, trauma and racial justice. With a focus on implications for public policy, community responses and social work practice, the 18th Annual James L. Stone Legislative Policy Forum brought students together with neighborhood, community and political leaders, and other experts. They discussed the trauma, pain and disruption of gun violence, and what is being, and should be, done to address this issue. 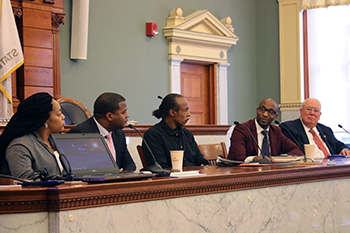 “The Lived Experience: The Front Lines of Gun Violence and Community Trauma in Syracuse” was one of several panels that took place during the recent 18th Annual James L. Stone Legislative Policy Symposium. Panelists included, left to right: Lepa Jones, president, Mothers Against Gun Violence; Randy White, project director, Syracuse Cure Violence; Clifford Ryan, founder, OGs Against Gun Violence; Rev. David Bulluck, founder, Change Agent Consortium, and; Alejandro Garcia, professor of social work. Keynote speaker David Alexander Bullock presented, “The Crisis and Trauma of Gun Violence in the City.” Bullock is the pastor of the Greater St. Matthew Baptist Church in Highland Park, Michigan, and founder of the Change Agent Consortium, a national coalition of faith, labor, civil rights organizations and active citizens committed to social change by combining the power of direct action, public policy and local projects. School of Social Work faculty involved in the day-long program included Keith A. Alford; Alejandro Garcia, professor; Eric Kingson, professor; Tracey Marchese, professor of practice, and; Matthew Spitzmueller, assistant professor. Guest speakers and panelists included Pam Hunter, assemblywoman, New York State Assembly; Timothy “Noble” Jennings-Bey, founder and CEO, Street Addiction Institute Inc.; and Helen Hudson, Syracuse Common Councilor at Large and president pro tempore, among many other community leaders. The day-long event, held at the Onondaga County Courthouse, was organized by Kingson in collaboration with Alford, Kenneth Corvo, Nancy Mudrick, Spitzmueller and other social work faculty, and M.S.W. graduate assistant and conference coordinator Jelilat Williams, as well as Sandy Lane, a professor in Falk College’s public health program whose work has addressed the conference topic for more than a decade. School of Social Work alumnus James L. Stone, MSW ’64 created an endowed fund to support this event into the future and was involved in this year’s event. “Once again, the School of Social Work has brought together an informative panel of experts, law makers and committed community leaders who bring clarity, understanding and passion to a significant issue that is relevant to social work practice and policy. We are indebted to James Stone for his generosity in endowing this event,” says Diane Lyden Murphy, dean of Falk College.